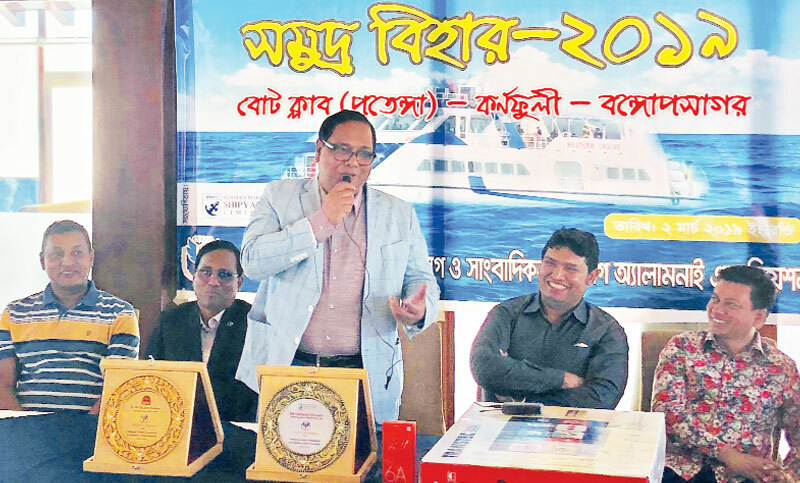 Western Marine Shipyard Limited (WMShL) Managing Director (MD) Md Sakhawat Hossain said that waterbus service will be introduced from Sadarghat to Patenga by June to ease movement of the commuters, mainly those of the air passengers. The WMShL MD disclosed this while addressing at the annual gathering of Chittagong University Communication and Journalism Alumni Association (CUCAJA) at Fly View Restaurant in the city’s Boat Club area on Saturday. Sakhawat in his speech said it takes some two and a-half hours to reach the Chattogram Shah Amanat International Airport from the city centre due to huge traffic congestion at different points in the peak hours. After introduction of the waterbus service, passengers will be able to cross the distance within 20 minutes, he hoped. WMShL’s sister-concern SS Trading will operate the service with other concerned organisations under the supervision of Chattogram Port, said the MD. Besides, construction of another terminal in Patenga is going on, said the MD. Steel manufacturing company RSRM Managing Director Md Mizanur Rahman said they have been continuing relentless efforts to supply quality product in the market for contributing to the country’s economy. Western Marine Services Limited Managing Director Abu Md Fazle Rashid, CUCAJA President Shimul Nazrul, General Secretary Hamid Ullah and the department Chairman Abul Kalam Azad were present at the gathering among others.